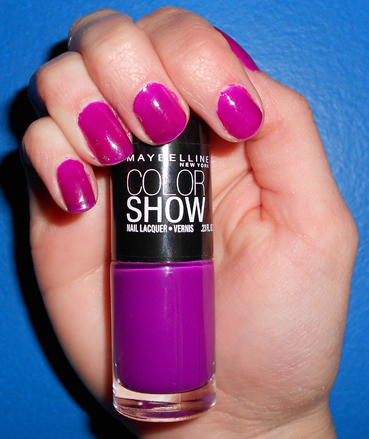 Maybelline Color Show Nail Lacquer Fuchsia Fever #300 is a bright fuchsia purple colour. It is a beautiful colour for summer and I will be wearing it all the time. Fuchsia Fever is the first nail polish I tried from Maybelline’s never color show nail polish line. The formula glides on nicely and looks good with two coats. I did notice that when I went into the sun that I should have applied three coats. I recommend applying a top coat as well because Fuchsia Fever drys matte. Something I noticed that the bottles are a little smaller than usual and are only .23 fl. oz. But they were cheap so I guess that makes up for the difference. The colours from Maybelline’s Color Show line are absolutely stunning and bright. Perfect for summer! I’m so excited to try the other colours that I purchased.